The irresistible Jake & Laura return in Michael Murphy's witty, fast-paced mystery series—perfect for readers of Dorothy Cannell and Christopher Fowler. 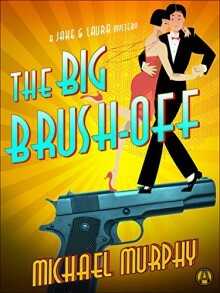 In The Big Brush-off, the charming and indomitable duo heads to the Midwest to solve a chilling cold case of a young girl's murder. Blackie Doyle is dying. That's what Jake Donovan's literary agent tells him. Sales are falling, and the rough draft of Jake's latest Blackie novel doesn't look promising. Maybe Jake has been distracted by a recent barrage of real-life homicides, or by his marriage to the beautiful up-and-coming actress Laura Wilson, now slated for a part opposite Clark Gable himself. Whatever the reason, Jake decides to return to his roots. Which is why he and Laura hop the next train to the small town in Pennsylvania where Jake once worked as a Pinkerton detective. Ten years ago, the murder of a teenage girl interrupted life in quiet, God-fearing Hanover. The unsolved case has always gnawed at Jake, and it seems no coincidence that as soon as he starts digging up old ghosts, he's once again writing like a dervish. Nor is it surprising that some townfolk would rather see the truth stay buried—and maybe even Jake and Laura with it. But the glamorous crime-solving pair refuse to leave before sorting through a bevy of suspects—and at long last nailing the one who almost got away with the not-so-perfect crime.